Yesterday began with a puzzle — could I get to school on my own without getting lost? 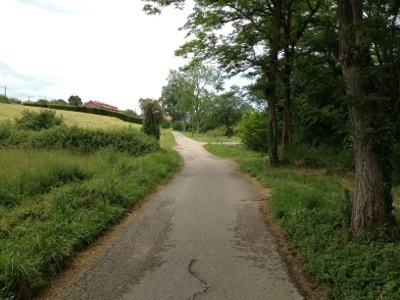 My class is now starting at 10:00, while Thomas heads to school for a 9:00 class, so without my guide today I would have to figure out the serpentine roads from Via dell Streghe down the hill to Comitato Linguistico, near the bus station. Google Maps was little help — it doesn’t know any of the side alleys and most of the stairways that shorten the trip. Still, I managed to make it in under 20 minutes, only about twice as long as it took with Thomas the day before. When I arrived I learned from Frederica, who runs the school, that my class would be shortened since there are only two students. That means we’ll start now at 11:00. Once our teacher, Maria, arrived, Patricia and I went to work on some very basic but helpful material — what letters make what sounds, conjugation of the verb “avere” (to have), and some basic descriptors about people — work, education, marital status, etc. Our biker gang outside the Touro train station. When class finished at 1:00 I was starving, so I decided to head across the street for a quick slice of pizza before our bike excursion would leave at the prearranged time of 1:30. After two quick slices I returned to the school at 1:25, only to find that our bike group had already left. Frederica showed me to the bus so I could catch up to them at the train station, but when I arrived at the train station none of my schoolmates were there. To me this didn’t seem like too much of a problem, since it was raining hard and I now had two good excuses to go home and get some anti-jet lag sleep. I gave it one last try by calling Frederica and, while on the phone to her, Hugo, our guide for the trip, miraculously appeared in front of me. The other students had disappeared across the street for their own slices of pizza. Hugo apologized for leaving without me and I apologized for stepping out for an early lunch. Soon all 10 of us were gathered at the now sun-drenched train station, ready to head to Touro Sul Trasimeno, about 20 minutes away, for our bike trip. I took on a hitchhiker. 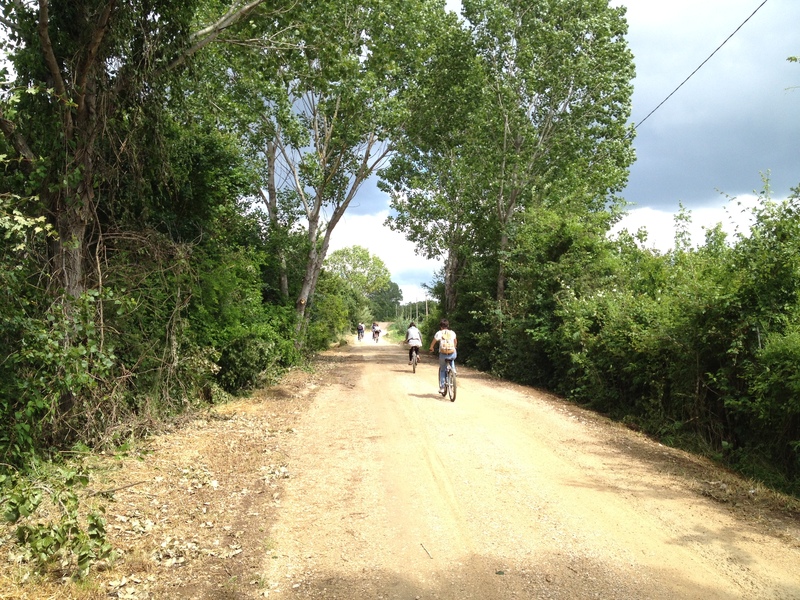 After walking from the station to a bike rental shop we headed out along a dirt road near the lake in bright sunshine. I think we all enjoyed the combination of natural beauty and exercise. We did have a couple of accidents, the worst being a spill by Tamila that resulted in a few scrapes and, I’m certain, some bruises too. 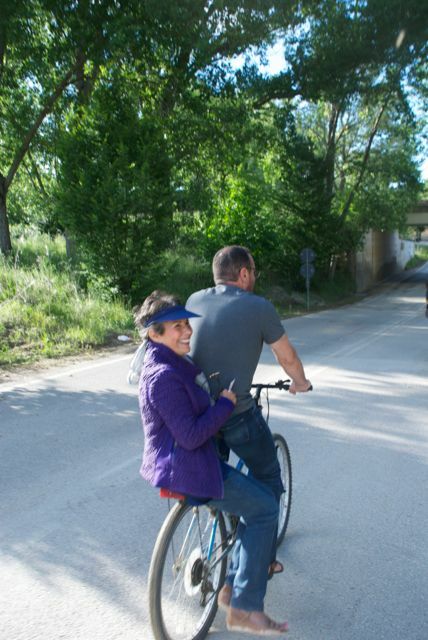 Roxanna’s bike pedal fell off, so I traded her bikes, and then Delia became exhausted and hitched a ride on the back of my bike for the last kilometer. This all contributed to helping me feel useful. We enjoyed a beer and gelato near the end of the trip, then jumped on the train back to Perugia. 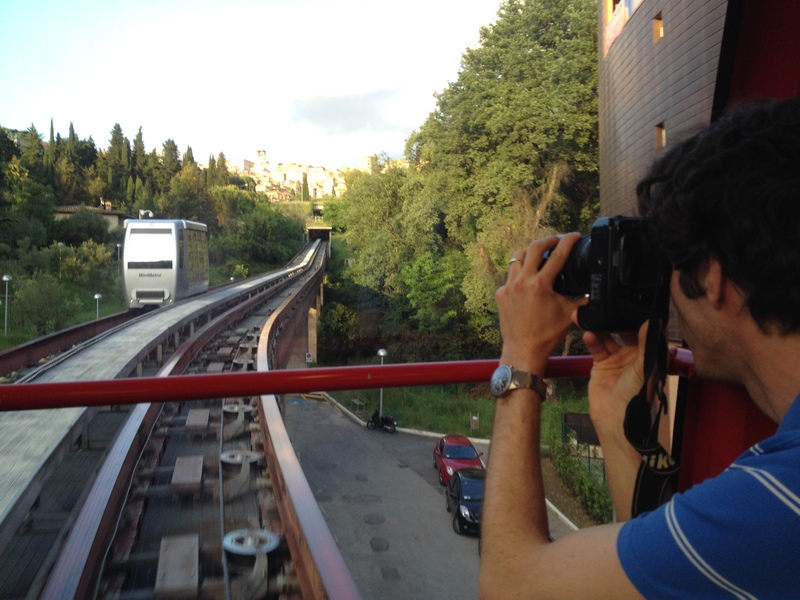 A photo of Thomas taking a photo of the MiniMetro. Back in town we explored one of the amazing features of the Umbrian capital — the MiniMetro. It’s a light rail system with tiny cars that transport passengers up and down Perugia’s big hill — from the train station nearly to the top of the old city. It has its own tracks and tunnels and is a gleaming, modern example of how to enhance the pedestrian experience and keep people off the roads. After marveling at the MiniMetro I made it back home at about 8:00 along with a bag of soap, shampoo and other supplies from the Farmacia. Graziella had prepared heaping plates of “bow-tie” pasta in red sauce followed by some tasty cod as a second act. I cleaned my plates and then headed out at 10:00 p.m. to meet with Gigi. As I had researched the Via di San Francesco I came to understand that there are three main tracks, the most well-funded one being sponsored by the Umbrian Office of Tourism. It’s well-marked by the familiar blue/yellow signs and has an excellent website, full of helpful information. After posting about my trip on my blog and others places I somehow soon was making Facebook friends with people in the Tourism office. 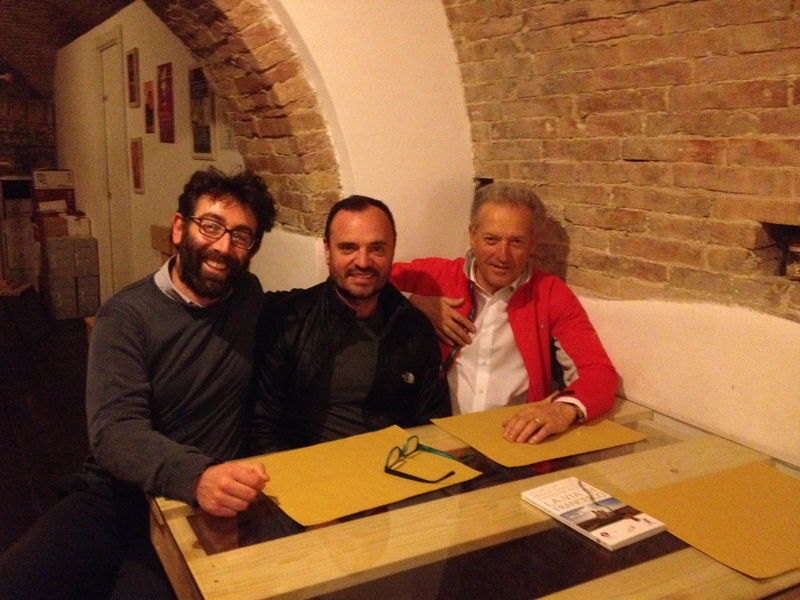 I was told I had to meet Gigi (Gianluigi) Bettin, who has taken on the Via di San Francesco as his primary work. He had been following my blog and texted me just after I arrived in town, inviting me to meet and discuss all things cammino. Earlier today I’d set up a meeting for us at 10:00 p.m., the earliest my busy social calendar would allow. Gigi (left), me, and Ciso, talking serious pilgrim talk. Gigi’s book is in the foreground. We met at the fountain in the main piazza and Gigi had with him a gentleman named Ciso B_______, a government official who supervises the Tourism Department and other offices for Umbria. He’d run into Gigi on the street just before our meeting and Gigi invited him along to meet me. It was great to know Ciso, since it had been his decision that in 2008 set in motion the creation of the Via di San Francesco. Gigi was hired as a result, and he was responsible for commissioning the way marks and setting in place the website and infrastructure that created this cammino. I felt honored to spend time with these two gentlemen who’ve pulled together what I believe is a truly excellent pilgrimage walk. As we talked, Gigi and Ciso showed a lot of interest in the post-Florence and pre-Rome stages I’ve included in my itinerary. They agreed that walking from Florence to the start of their itinerary at Santuario della Verna could be challenging. They also agreed that the walk into Rome needs more signage and infrastructure. I encouraged them to recognize that their Franciscan pilgrimage presents an attractive option for the 250,000 people each year who’ve walked the Camino de Santiago and are looking for their next great adventure. Gigi also shared an interesting detail about his book, La Via di Francesco. His co-author is Paolo Giulietti, a local Catholic bishop who also serves as chaplain for the Italian Santiago confraternity. Don Paolo’s partnership closely connects the pilgrimage to the Catholic Church, which is a real plus for religious pilgrims. Gigi clearly has a great appreciation for the genuine spirituality of this man and I hope to meet him while I’m here. In addition to encouraging me to meet Don Paolo, Gigi invited me to several upcoming meetings — one with the Italian Santiago confraternity in a couple of weeks, and one with Italian pilgrims who’ve completed the Camino de Santiago, the Via Francigena and/or the Via di Francesco. One is here in Perugia and the other is in Florence in a couple of weeks — I’ll have to see if it can fit either onto my crowded calendar. The subject of the Italian confraternity reminded me of my experience at the Albergue San Nicolas at Puntetitero, run by the Italian confraternity, on the Meseta in Spain. I’d walked there almost exactly three years ago, arriving in the evening after a long and somewhat waterless walk that had begun 37 km (23 miles) earlier that day. Gigi’s eyes sparkled as I told him the story. The place is now my favorite albergue, infused as it is by the joy of the Italian hospitaleros who put on purple capes and wash the feet of each weary pilgrim before serving them a meal of tasty pasta and wine. 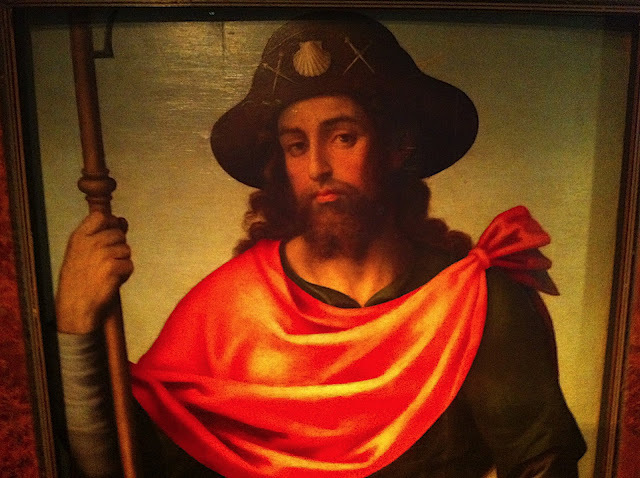 Their attitude is very Christlike, spiritual, and loving — and their attention makes San Nicolas one of the highlights of the Santiago pilgrimage, brought to you by Italy. I see this same love of pilgrimage in Gigi and Ciso and I look forward to a partnership with them in helping others discover their creation, the Via di San Francesco. The busy-ness of the day is keeping me from being homesick, I know. I’m missing Theresa, missing the church, missing Seattle. 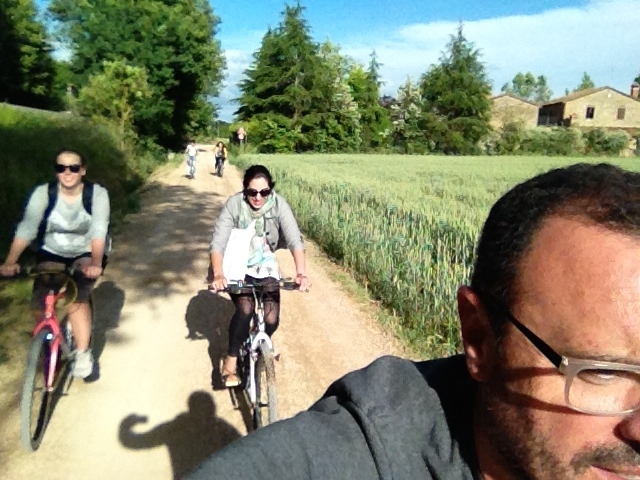 But today was a day of new friends — “amici” — on “bici” (bikes) and with Gigi. As I sat with Don Crawley at Sea-Tac Airport on my way to Italy he said, “Wow, you’ve had a lot going on in your life.” Don’s right, and it’s clear I haven’t had a lot of time to sort through it all. The after-effects of the many changes appeared at different times yesterday. The most obvious change, of course, was leaving Seattle to go to Italy. My arms felt like they were glued to Theresa as we hugged at the Departures driveway at SeaTac Airport. I didn’t want to let this great woman go. She’s become very important to me since we met on October 31st last year and I’m really not ready to put our relationship on hold with so much yet to discover. This whole Italy plan was hatched before we met and I’m not sure I could’ve passed up a summer with Theresa if I’d known about the possibility as I got the wheels rolling for this Italian guidebook adventure. 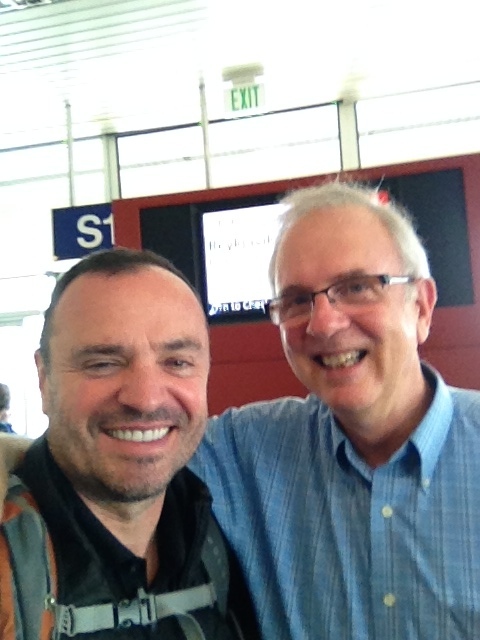 With Don at Gate S12 at SeaTac Airport – day of departure. After passing through security, my friend Don Crawley was waiting for me with a cheerful smile. He had noted via Facebook that we’d be at the airport at around the same time — Don going to Los Angeles on business. while I headed to Italy. We sat together over coffee and a pleasant chat while we awaited my plane which would be the first to leave. We began plotting a future rendezvous — Don is cooking up a holiday in France this summer while his wife, Janet, is teaching a class near there and we’ll meet in Florence for a guys’ holiday in the city of Michelangelo. As we talked, Don may have noted that I had already started to succumb to what I’ve come to call my “travel coma.” My speech starts to slow down, my eyes take on this drowsy look, and my brain begins to operate at partial capacity. It’s something like going into shock after an injury, but a travel coma for me is an odd deadening of senses that somehow helps me deal with the discomforts of being jammed into a small seat for hours at a time while changing time zones, languages, currency and cultures. After saying goodbye to Don the coma began to take hold. The flight to Iceland took off at 4:30pm Seattle time and arrived at 5:30am Reykjavik time, but somehow there was never a sunset. Our jet took us north quickly enough that we squeezed dusk and dawn together somewhere above the Arctic Circle. By the time I got to Iceland I’d slept just a touch. I grabbed a sandwich, and orange and some chocolate milk for what I guess was breakfast and then stepped right onto my London flight. The couple next to me must’ve enjoyed watching my head bob up and down as I drifted into and out of sleep in the window seat. I briefly emerged from my coma as I arrived in London and I realized right at Passport Control that due to the lack of a pen I hadn’t filled in my Arrival Card. I borrowed a pen in line and quickly filled it out with a quick scan and some scribbled responses. Then, when I arrived at the passport desk, the immigration officer asked one of those innocuous but deeply meaningful questions. How could I tell her that I wasn’t sure anymore? I’d just retired after 34 years of ministry as a pastor and was heading to Italy to study Italian and write a guidebook. Not only that, but I hadn’t had time to consider all the consequences and was in a jumble of feelings in the purgatory between the past and present. “I’m self-employed,” I blurted out. “Self-employed doing what?” she said in her British accent. “OK, you could just put down, ‘writer,'” she said as she filled in my occupation for me and stamped my passport. And there it is. If anyone asks, I’m a writer. The lady at the desk said so, and I’m not going to argue with her. The vocational transition occurred in a 10-second conversation. Goodbye, pastoring. Hello authoring. The pastoring took four years of seminary, a handful of interviews, psychological testing, much fervent prayer, and the laying on of the hands of two bishops. Becoming a writer took a book contract and the quick decision of an Immigration Officer. Both were conferred on me by others, came after a period of waiting and involved paperwork. So my new vocation sounds official and, at least for now, the appellation will have to do. 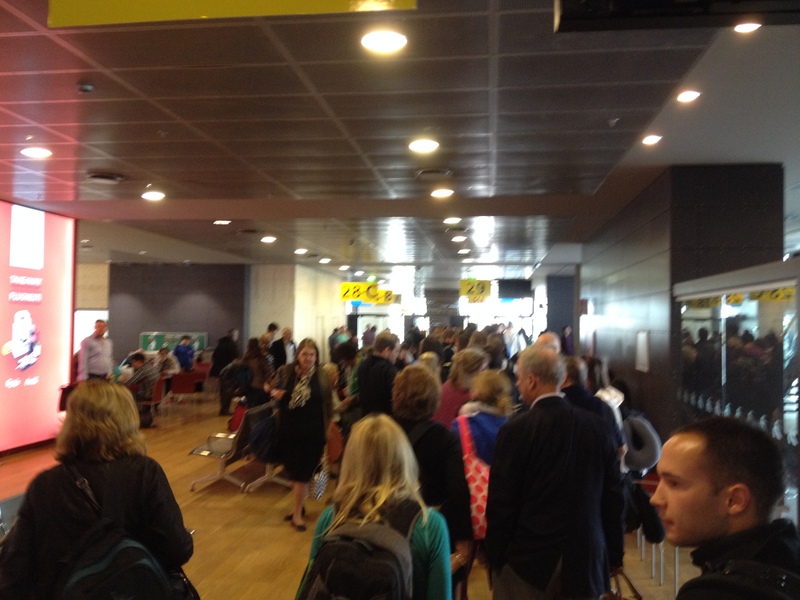 Inside Terminal 5 at Heathrow after being ordained a writer. 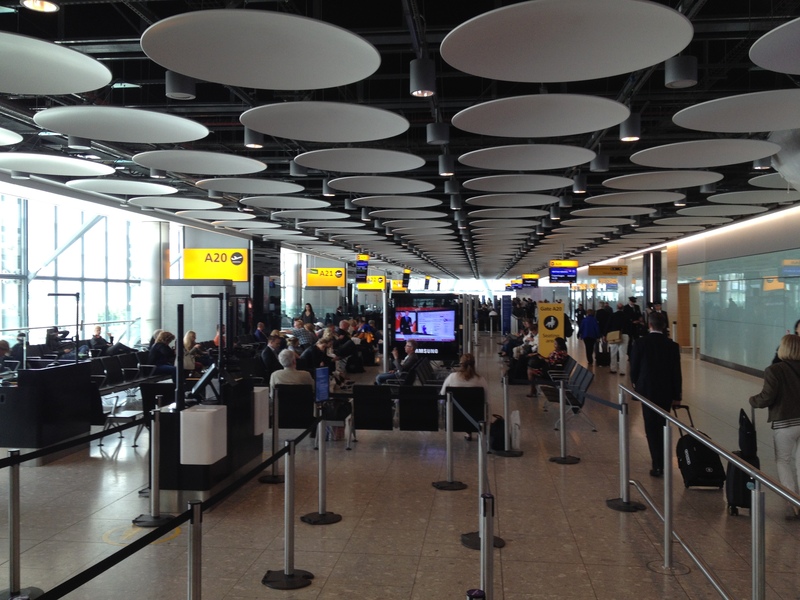 After being ordained a writer I stumbled my way between Terminal 1 and Terminal 5 of Heathrow and boarded British Airways for Rome. Following more dozing in the window seat, bathed in the sunlight-that-should-be-nighttime we landed at Fiumicino Airport. Italy at last. I boarded the train for Termini Station where I’d reserved a B&B for the night and am pretty sure I had a pleasant conversation through the drowsiness of my coma in French, Spanish and English with a retired couple from Montreal in the seats across from me. Then I made my stupid mistake. I was on the curb outside Termini Station, still partially comatose, when I suddenly realized I didn’t know where my B&B was located. I vaguely remembered it was close to Termini, but without an Italian cell phone plan, my usual guide — Google Maps — was unavailable. A man yelled “Taxi!” and I ignored him, but then impulsively turned around, threw my bags into his car, and told him where I was headed. He took me on a whirlwind drive for about 10 blocks — right back to a point at the train station about 2 blocks from where we’d started. Then he demanded 25 Euros. Hotel Girandola Bed and Breakfast. Just a block from Termini Station. I just laughed. Then I said “No,” and handed him a 5 Euro note and some change. He complained loudly in Italian. I smiled and politely stood my ground — I wasn’t going to pay this scoundrel another cent. After he drove off in a cloud of probable profanity (speaking words I may not learn in my upcoming Italian studies) I wandered a couple of blocks away and found my B&B — right across from the train station, not a block from where I had picked up the cab. 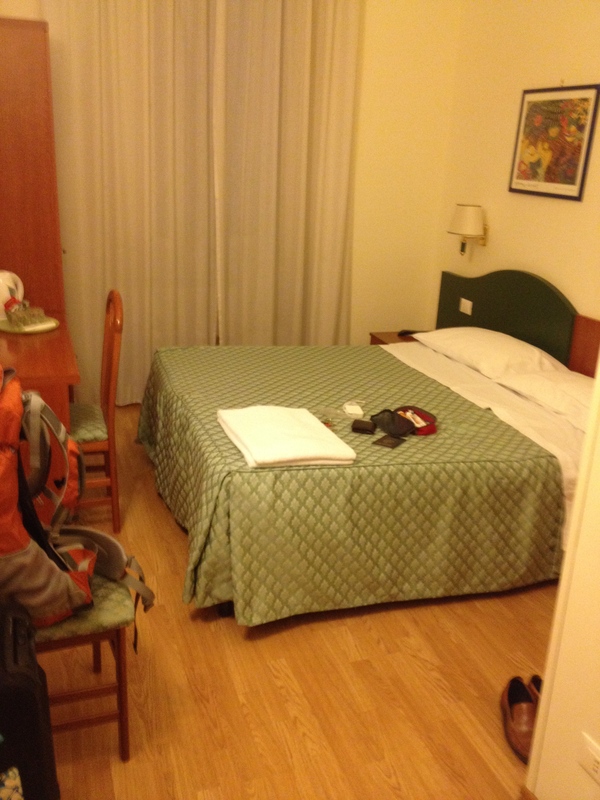 I buzzed the door at the B&B, found my simple, cozy room, had dinner nearby, and headed to bed to sleep off my coma and begin my Italian adventure as a writer. Ciao, Seattle. Bongiorno, Italia. July 26 — Slow day here in Galicia. 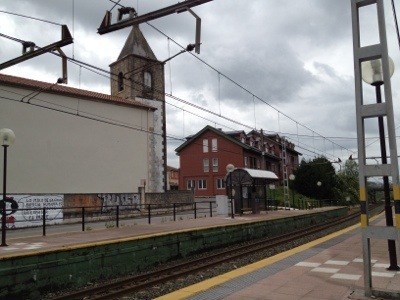 Knowing I would miss Finisterre I hunted down the train station and bought my overnight ticket for 7/28 to Madrid. I then emailed my Spanish teacher back home to ask her about a Madrid museum she mentioned, then I booked a hotel near the train station and museums. My flight to SEA was set for very early Friday morning. I had a goodbye lunch in the afternoon with Artur and also Andre of Montreal following pilgrim mass. There was still a huge line for hugging the Santiago statue, so I decided to wait for that until tomorrow. 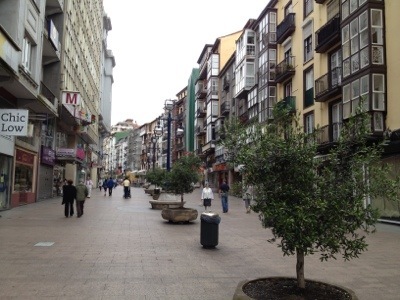 I found a quiet corner in a square and sat and jotted down the completed itinerary of my camino and reviewed my emails so I wouldn’t forget details. July 27 — Caught up on my sleep today. Slept until 07:30, then off to breakfast and a 1 hr wait to hug the apostle. Then back to the room to sleep until 11:30. Wake for lunch then visit to museum, then back by 15:30 to sleep until 20:30 an wake up in time for dinner. Tonight got ready and jumped on the train to Madrid. Farewell, Santiago, mi amigo. I shall return to see you again. Spanish groom sits in Burgos train station. May 30: I left Santo Domingo at dawn in a white taxi and watched out the window as future camino miles whizzed past. I saw several pilgrims braving the wind and light rain of this day, and once again I was amazed at the colors of the springtime grain fields. I arrived at Burgos in plenty of time for my train and waited at a cafe as one of the oddest sights of the camino unfolded before my eyes. A group of young Spaniards escorted one of their friends into the train station. He was blindfolded and wearing a bright wig and ballet tutu. He had some kind of sock around his male appendage and it became clear he was getting married this weekend and his friends were giving him a pre-nuptial hazing. He took it “like a man” and the whole episode evinced chuckles from the assembled train goers. 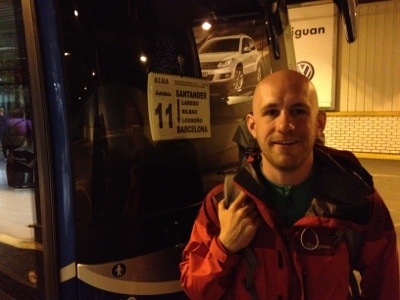 I boarded the train to Burgos, looking ahead to a five-hour journey and enjoyed every moment of this trip to Bilbao. Through fields and forests and across rivers — this was an introduction to the beauty of Northern Spain and I was glad for the opportunity to see this beautiful region. I arrived at the train station in Bilbao and spotted the gorgeous stained glass window above the train gates. Then I caught a taxi for Bilbao’s airport and my flight to Copenhagen. My wife, Gail, an anesthesiologist and professor of bio-medical ethics, was to speak to the European Society of Anesthesiologists that weekend. It was a big event and her first European speech. When I arrived in Denmark I soon realized there were two Sheraton Hotels and I wasn’t certain at which one Gail was staying. I guessed which one and when I arrived at the lobby I asked the desk to call her room. Gail answered the phone and asked the odd question, “Where are you?” I told her, “I’m down in the lobby,” and she was ecstatic. Her friend, Pam, had joined her for her Copenhagen visit and for a couple of weeks of sightseeing between there and Rome, so the three of us spent the next days enjoying this amazing city and listening as Gail shared his outstanding speech with the European Society. Since Gail is a doctor I asked if she’d be willing to take a look at the blisters on my feet. “No!” she said, “They’d be too gross!” Even without the support of My Own Private Physician the days away from the camino brought healing to my feet and by the time of my return to Spain I felt much better. My only regret was that I’d left my favorite baseball cap back at the hotel in Santo Domingo and I expected I’d never see it again. June 2: After a great weekend in Copenhagen I said goodbye to Gail and Pam and headed back via plane to Bilbao. My friend Stefan had suggested that I needed a cell phone so he could send me SMS texts, so I obliged and purchased a cheap cell phone and some minutes as I waited at the Bilbao train station. 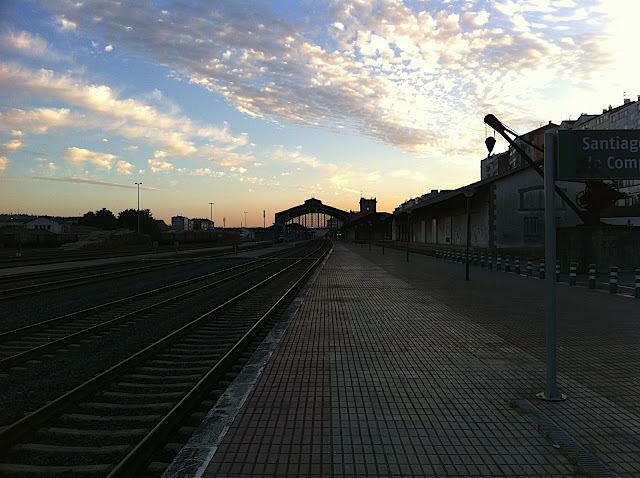 I boarded the train back to Burgos and caught a taxi to Santo Domingo. As I checked in at the Parador I asked about my hat and, sure enough, they’d kept it safe for me. From then on I’d have a fondness for this hotel and the great Parador chain.